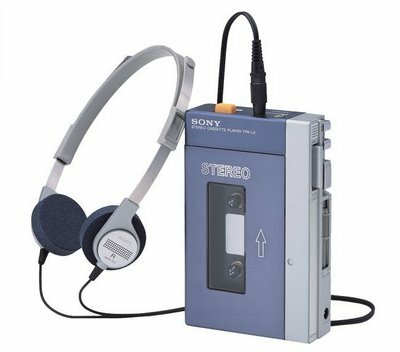 Murky Memories: I won a Sony Walkman by having two matching halves inside my Nestle Crunch wrapper in 1981. There’s actually a great deal more to the story. I had ridden my bike to the local 7-11, lied about it to my parents, and been spotted on the way home by my father as he drove home from work. I won a walkman, but lost access to it for several weeks. Pretty cool though. It was about a $100 value at the time. I’m a big fan of cassette players. That’s where I invested my money, and I was such a passionate fan of the medium that tried to save up for a DAT machine believing that CDs would have the same flaws of LPs and that the future of portable music would be in cassette form. Ha, little did I realize. My original Walkman lasted a long time. And in 1995, I bought Aiwa brand portable cassette players for the groomsmen in my wedding. It’s still fully functional and used by my kids (or it was until they got Zunes). It’ll always have a home, because I have a whole box full of cassette tapes, which I can only play on that little Walkman… or Walkman-like device.